In this practice test you will be required to answer all 13 questions about speed limits from the Driver Knowledge Test Question Bank. Permitted only when passing another vehicle. Only permitted when other vehicles are going faster than the speed limit. You are driving in busy traffic in an 80 km/h zone. It begins to rain lightly. What should you do? Slow down to a speed that suits the conditions better. Keep going at the same speed because that's how fast the signs tell you to drive. Pull over and wait till it stops raining. You are driving in a 70 km/h zone, keeping to the limit. Several vehicles pass you. One of your passengers suggests you should keep up with the other traffic. What should you do? Decide your speed yourself, based on the speed limit and the conditions. Follow the suggestions and keep up with the traffic. Speed up to a little bit over the speed limit, because everyone does it. You are driving in busy traffic in a 60 km/h zone. You feel 60 km/h is a bit too fast for the conditions. What should you do? Slow down to a speed that suits the conditions. 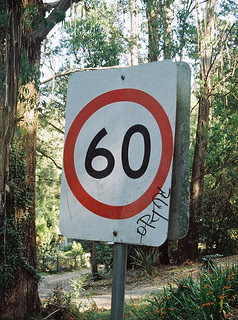 Keep up with the other traffic because it's probably safe if the sign says 60 km/h. Turn off the busy street and wait for traffic to clear. Fines, demerit points and possibly loss of licence. A letter of warning and a small fine. No matter what your reason is. Only if it is turned on. If you purchased it after 1998. There are street lights along the road. The road you are driving on is gravel. There's an emergency, which mean speed limits don't apply. Not exceed 40 km/h and keep a special lookout for bicycle riders, pedestrians and children. Only enter the street if you live in the local zone. Drive at a speed less than 40 km/h if you are not a resident of the local zone. Share this road with other people and vehicles and not exceed 10 km/h. Drive at 10 km/h if there are pedestrians around. Reduce your speed to what you think is safe but never below 10 km/h. Slow down immediately to 40 km/h or less even though other drivers want to go faster. Drive at the speed of the other drivers because it is safer to go with the flow of traffic than slow others up. 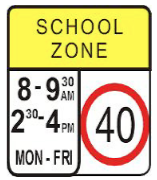 Stay at 60 km/h because it is nearly 9.30am and the times on the school sign are only advisory. The maximum speed they are allowed to drive. The minimum speed they are allowed to drive. The recommended speed they are allowed to drive. Slow down to the new speed limit. Drive through the road works zone as fast as you can to get past it. Drive at the same speed as other vehicles.